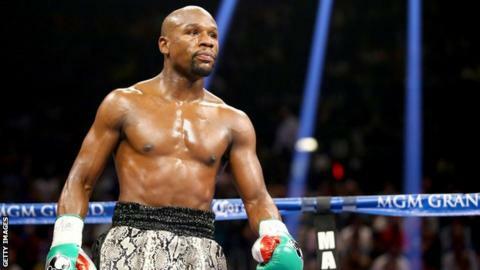 It was the moment Floyd Mayweather Jr saved his father's life, though he was too young to have any say in the matter. Mayweather, now 38 and the WBA and WBC welterweight champion, is preparing for Saturday's super-fight against Manny Pacquiao at the MGM Grand in Las Vegas. Speaking in a special BBC Radio 5 live programme on the American's upbringing, Floyd Mayweather Sr explains how he used his baby son as a human shield when threatened at gun point. "I used my man because if I hadn't, I wouldn't be here today," says the 62-year-old. "I was still shot in the leg. What would you do with a gun on you?" In an interview with Rolling Stone magazine in 2012, Mayweather told how his father was attacked by an uncle on his mother's side over a "beef" the pair had when he was not quite two. At the time both Mayweather senior and 'Baboon' - Mayweather's maternal uncle - were involved in drug-dealing in the American city of Grand Rapids, Michigan. "You got your son and you know that he's the nephew of the uncle, the guy who shot me," Mayweather Sr says. "This is my only shield, and I got shot with him in my hand. He shot a big old hole in my leg, and I'm telling you that it would have been in my head or my chest. "Right there is your wife - and this is her son too - and she was telling me to give her the baby. The guy had the gun on me just waiting. "Who would be crazy enough to say, 'Here's the baby'? Ain't it obvious he would have killed me?"